Thanks to recovering economies and federal initiatives, local government highway projects are starting to expand. 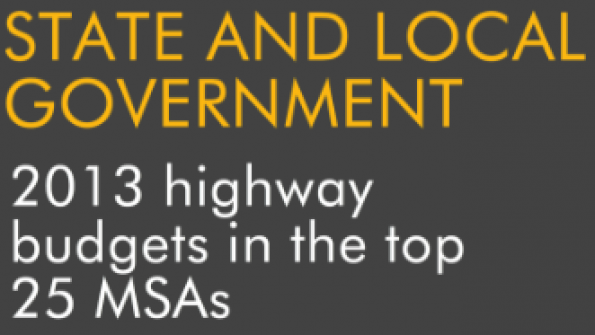 In an exclusive for American City & County, Govalytics analyzed the top 25 MSAs to find the top five cities with the highest budgets for highway projects in 2013. Although the recession took a bite out of highway spending, it appears this sector is beginning to recover. Below are the top five cities within the top 25 MSAs with the highest budgets for highway projects in 2013. Click on image to expand as a .PDF. Sister publication Government Product News reports that things are looking up for highway projects across the country. By 2017, revenue for the road and highway construction industry is estimated to increase at an average annual rate of 2.2 percent to $53.3 billion, nationwide. Budget cuts and reallocations to increase spending on unemployment, social services and Medicaid forced some state and local governments to cut funding for surface transportation projects, but the 2012 passage of the Federal Moving Ahead for Progress in the 21st Century (MAP-21) Act could help the industry rebound, according to Government Product News. A two-year transportation reauthorization bill, the MAP-21 Act injects $572 million for FY2014 into the Federal Motor Carriers Safety Administration administrative expensive and grant programs, according to U.S. Department of Transportation Materials. Additionally, a boost in tax revenue from the improving economy should help state and local governments increase transportation infrastructure spending in the near term, Government Product News reports.